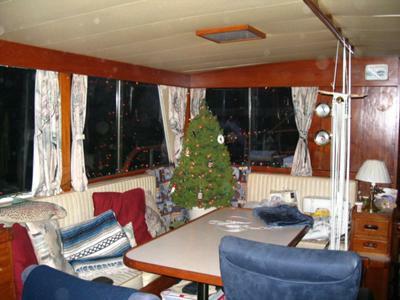 Cyderworks is a Grand Banks Motor Yacht with (2) 135 H.P. John Deere Diesel engines. She was built in Hong Kong in 1973 and finished 1974. Her hull is wood made of mahogany planking with teak rails. She holds 1000 gallons of fuel and 500 gallons of water. She came from Florida in the 2000's and we purchased her in Washington in 2001. She is a live a board with upgrades 6KW Northern Lights Genset, Wabasto Diesel heating and Vacuflush toilets. Cyderworks is 48' and 52' overall, a 15.5 beam and 5'6 draft. We have 3 state rooms and 2 and half heads. She needs some wood work. Am open to reasonable offers. Contact Info: (360) 480-4920, shecap53 at yahoo.com. May your last voyage be down the Rhein river. Stop at Nierstein and I'll get aboard.